Once again, court reporters are making sure that the stories of America’s veterans are recorded for future generations. 2013 marks the tenth consecutive year that the Veterans History Project (VHP) has worked with the National Court Reporters Foundation (NCRF) and the National Court Reporters Association (NCRA). The mission of the Veterans History Project at the Library of Congress American Folklife Center is to collect, preserve, and make accessible the personal accounts of American war veterans so that future generations may hear directly from veterans and better understand the realities of war. U.S. Representative Ron Kind (WI-3) proposed the Veterans History Project after interviewing veterans in his own family at a reunion. His wife, Tawni, a court reporter, knew that transcriptions would ensure the accessibility of interview content. To date more than 2,800 interviews in the VHP collection have been transcribed by court reporters. Once a court reporter transcribes an interview, the transcription is sent to the Library of Congress to be added to the veterans collection, and, in many cases, it is digitized so that the public may access the transcript online. Not only do court reporters serve VHP by transcribing oral histories that are submitted to the Library of Congress, they also dedicate their time as volunteer interviewers. “I can’t tell you how rewarding it’s been to me to work with such dedicated professionals at VHP and with court reporters who unselfishly volunteer their time and talent to ensure that these stories will be preserved so that future generations of Americans will know of the sacrifices made to preserve our freedom,” said Beth Kilker, NCRF’s Oral Histories Program Coordinator. NCRF is also an ardent ambassador for VHP and has promoted “VHP Days on Campus” at various court reporting schools and firms. Most recently, NCRA held a VHP Day during the 2012 NCRA Convention in Philadelphia and is planning a VHP Day during the 2013 NCRA Convention in Nashville, Tennessee. In addition to recorded interviews, VHP also depends on volunteers to donate veterans’ original photographs, letters, military documents, diaries, journals, two-dimensional artwork, and unpublished memoirs. 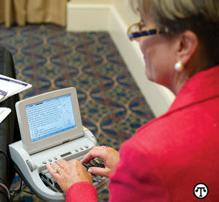 NCRF is a 501(c)(3) charitable organization and the philanthropic arm of the 18,000-member professional association for stenographic court reporters, NCRA. To learn more or participate, visit www.loc.gov/vets.